This might be the best thing I’ve ever single-handedly cooked. It might be the best way to dress up that dull chicken breast that probably tastes like paper if you’ve been sustaining a clean diet for, oh say, more than 4 days. This is a clean take on an otherwise decadent pasta dish, but it really hit the spot. Read on. In a food processor, combine the basil, sea salt, and pepper and process for a few seconds until the basil is chopped. Add the cheese (optional), pine nuts, and garlic. While the processor is running, add the oil SLOWLY until a fairly smooth sauce is formed. Keep a little texture, you know for a little something extra. 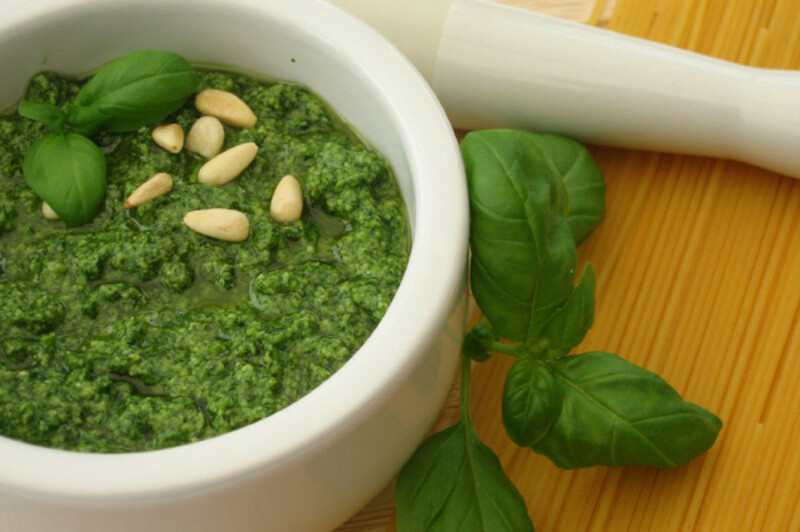 Transfer pesto to a bowl and set aside. Prepare chicken: trim the fat, rinse, pat dry, etc. In a ziplock bag place chicken breasts and pour in petso mixture and toss bag until the mixture is evenly coated around the chicken breasts. Refrigerate for about an hour (or over night if you have some time). Bake in a clear dish until cooked all the way through, about 20-30 minutes, at 350 degrees. Sound easy? That’s because it IS! I served this with brown rice pasta and homemade marinara sauce the other day. I made a larger portion so that I could have some for lunch the next day. I’m so glad that I did – I’ll just go ahead and give myself some props right now. It was a total home run. I can’t wait to make this again and get a little creative! This would also be great on a chopped up on a slice of ezekiel bread, or in an egg white omelet. Don’t be hangry. Be healthy. I love pesto!! Love you idea of tossing it on chicken, cooling & then baking! But I wanted to share with you how I make pesto! 🙂 The exact same way as you but sub sliced almonds for the pine nuts. SO yummy!! Thanks so much for reading and sharing your recipe! I can’t wait to try it next time – I’m already craving it!